Don't you love a birthday party? This weekend one of my cousins turns 50 and is having a bash right around the corner in San Diego. It is also college volleyball kick off so, I am heading to the courts. I am sorry I won't be there because these are the cousins I spent my summers with at Lake Delavan. Paul is the oldest in his family and was always the serious one. He made mazes and read lots of books, I guess that it is no surprise he is a doctor today. His sisters Mitzi and PJ were my buddies and we ran around together for weeks. The younger boys were Pete and Phil, and if we were desperate for money to go buy cinnamon toothpicks, sweet tarts or Pixie sticks, we would hide Pete's security blanket. It was worth a quarter or so in reward money. I'm sure my Aunt Tootsie was aware of our operation, and a couple of quarters would send us on the mile trek to the candy store. We really weren't terrible kids, we just had a mild sugar addiction! We even all went back to the lake for a reunion when our own kids were little and it sure was fun, but not quite the same as those days of the 70's. So when my cousin Patti (she was PJ, I guess she out grew that) sent me an email asking to order cookies for Paul's birthday, I was feeling a little silly for not thinking of it myself. Shipping cookies always poses a little problem with timing because you can never really count on the post office. And they must dry thoroughly before stacking them. So between my real job which has been a lot of hours and other cookie orders, I whipped up a few dozen cookies for Paul. Now these are not works of art. These are happy birthday cookies. This is not a black tie party, but a party with many family, friends and kids coming. I told Paul to think of the cookies as a collaboration between his sister and cousin. No guesses who the brains of the operation were all along! I am happy Patti thought of it, and I will be there in spirit! Hope 50 is fabulous! 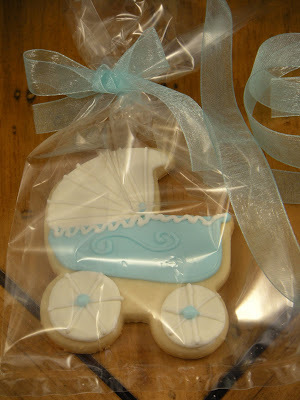 So real quick, I did a boy shower recently, and I loved these cookies. The more I make the more I am convinced that I like them simple. Blue and white was she wanted, no polka dots (darn, I love polka dots) and no glitter. Okay, I kept the disco dust away! And since I had a little leftover dough, I had some random shapes for a few miscellaneous events. Pretty straightforward, nothing exciting, just "eatin'cookies". Of course I made one special one lest someone forgets about me. Did your kids have a warm healthy dinner last night? Yea, mine too. But sadly there are a lot of kids going hungry right here in the U.S. This past weekend I had the privilege of working at my favorite kitchen store and manning the sugar cookie decorating station. 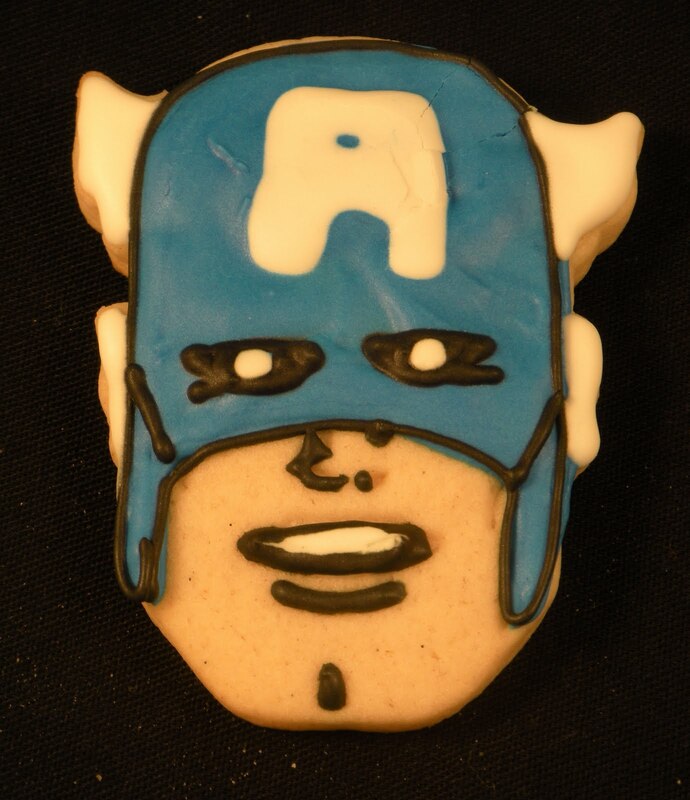 For a $5 donation, kids (or adults) could decorate 2 Marvel Comic Super Hero Cookies. It was a great event, albeit a little messy! But having done many sugar cookie classes in my home, I know you will only have to chase those wayward sprinkles on the floor for a year or so! And thankfully, royal icing washes out pretty well. All the proceeds go to No Kid Hungry/Share Our Strength. This website is full of information on how you can help, and for the foodies out there, there are many, many ways. Please take a look and pledge your support. You can participate in area events, host a bake sale (up my alley!) and simply make a donation. There are also products for sale at said kitchen store that send a portion of the sale to No Kid Hungry. So there are many ways to help. So on to the cookies. My favorite kitchen store sells the cutters, they include Hulk, Spider Man, Iron Man and Captain America. 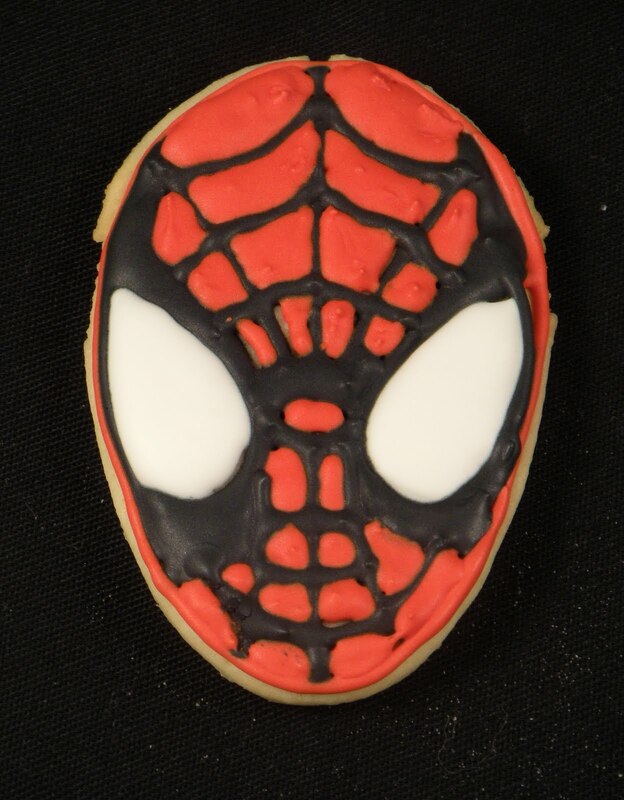 I baked plenty of all, but I was thinking Spidey was still the fan favorite. Wrong! Captain America flew out of the cookie bin for decorating, and perhaps that is because there is a new movie and "stuff" to promote it. The boys also really like my Hulk cookies with the tinted dough. 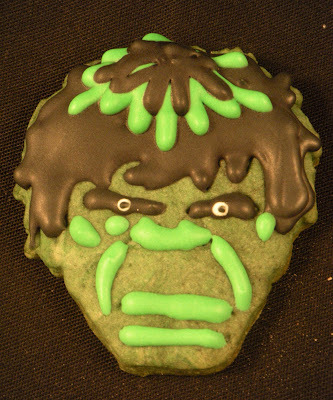 I used a little green and black in the dough and made decorating him much easier! 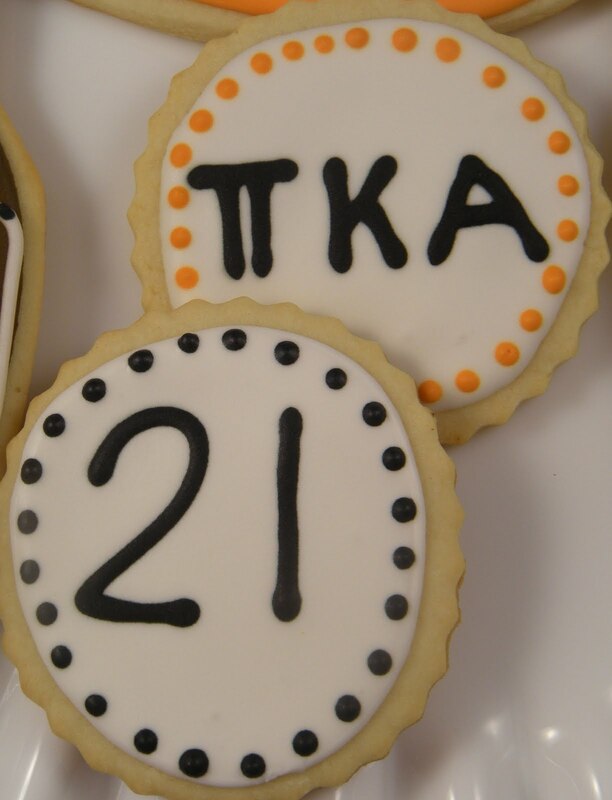 But regardless, we had plenty of cookies and lets just say an abundance of icing! 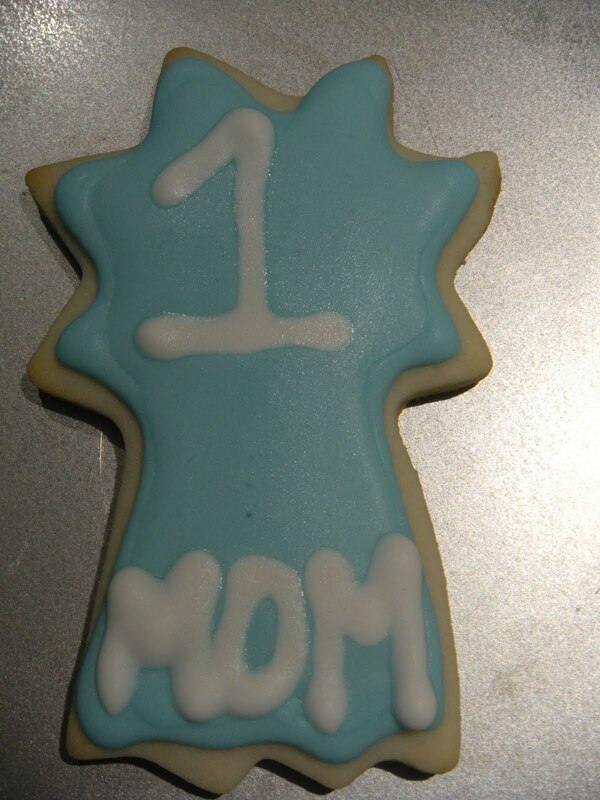 Kids like to decorate their own cookies. One little girl just loved layering all those colors and the sprinkles and wow, those little cookies were 2" high. 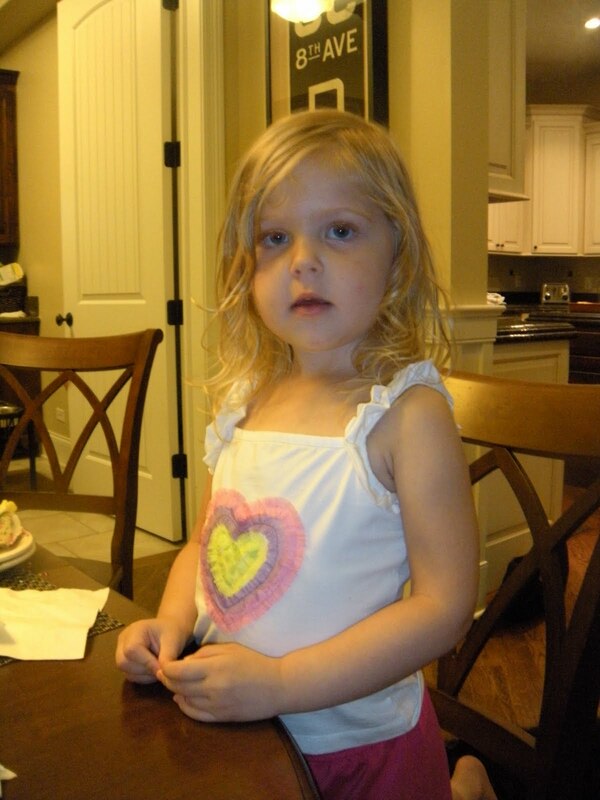 Her dad calmly suggested that she would be more comfortable eating the cookies in the store than in his car! One little boy took half an hour to decorate one cookie, and did an amazing job. His Grandpa was astounded and didn't know that this little boy had such patience and artistic eye. I was impressed. And of course lots of little ones showed up in their t-shirts and masks of their favorite super heroes. It was a fun day. When all was said and done, I decorated a few myself. Yes, Ironman is missing. I dropped him, so he did not make it to the photo shoot. Oh well. What are you waiting for? Get in there and bake, AND make a difference! You bet there'll be salad. For as long as I can remember we have always had a green salad with dinner. My Dad is Italian, my Mom is Serbian, and both cultures eat green salads. These are not crazy composed salads, no jello, no chunks of vegetables. Lettuce, vinegar and oil. Sounds boring right? Well, on the contrary. As a kid it was iceberg lettuce (I am not sure Romaine was available then), vegetable oil, apple cider vinegar, both sprinkled on top, and a little salt and pepper. We did not toss it until we were ready to eat it, so the salad came to room temperature, and was perfect every time. I hate a cold salad. Over the years the salad has morphed with only Romaine, olive oil, maybe a balsamic or rice vinegar, sometimes we toss some feta and olives or blue cheese. But believe me when I say, there will be salad. When I got married, I still made the Petitti salad every night. Scott was not interested. He wanted lettuce, shredded cheese and French dressing...eee gads! So for about 25 years, I ask every night, do you want a salad? If he says yes, then I dig out some shredded cheese and French dressing. Not really inspiring. He has branched out and had feta and olives, maybe a little pancetta, but it is always dressed with this vibrant orange dressing. And not just any French. It has to be the orange kind, not deep California French, he describes it as Pizza Hut French. And don't even think of trying to make this yourself! So, one hot summer day I am perusing the Web, and the local food editor features Salad Fridays this summer. And there one afternoon I found a grilled Romaine salad. The post is here, and I could hardly wait to make it. The original recipe is from Guy Fieri, and you know that I hate to follow a recipe. I used the same ingredients for the most part, but I didn't measure anything. Now you can see Guy's recipe if you need quantities, but I like more vinegar than most people, and after years of daily salad making, I can eyeball it pretty well. I also think this recipe, or rather this method, has some real possibilities, and I am excited to make more versions. I found these small, compact heads of Romaine in the produce section. I peeled off the outer leaves and sliced them down the middle. I drizzled them with olive oil and a little salt and pepper. In a small fry pan, I cooked up a little pancetta and diced red onion. When I buy pancetta, I have it sliced pretty thick and the layers divided with the wax deli paper. I usually buy many slices and leave it in the freezer and use a slice at a time. I find it easier to chop after it's been cooked. The pancetta renders its own fat, so if you need any additional oil, it won't be much. When the onion is soft and the pancetta crispy, remove it from the pan and add a little more oil and some balsamic vinegar. Heat it through and remove from the heat. Meanwhile grill the Romaine, indoors or out, cut side down until it is charred. Lay the lettuce in a bowl, cut side up, top with a little blue cheese, the onion pancetta mixture and the warm balsamic. This salad is amazing. So amazing in fact, that Scott begged to have it the next night. We tried it with regular bacon the next time, and ate a whole head of Romaine each....it was that good. Praise the Lord! I am never buying French dressing again! Every once in awhile I get a free pass on cookies. "Do what you think". This week was my first 21st birthday project. Now I need to order a beer mug for sure. But the mom and I talked about the interests, the school etc. This young man and my son went to school together for a few years, and I was happy to be a part of his birthday! So the kids are gone. They are now part of much bigger things than high school. University, College, teams and jobs. How exciting. Nic left a few weeks ago and I did cry. He is so far, and so old. I mean, when did my little boy turn 21. It seems like 18 was just yesterday. But then Christina. Off on her new adventure. It was a little sad, but the mom who tears up at commercials and can sob at the airport (if I see a goodbye), well, I didn't shed a tear. She is going to have fun. College should be fun. I loved college. So I couldn't send her without cookies. I like it when her friends remind her that her mom is a great baker! So here are the cute Millsaps M and volleyballs I sent for the team on bonding night. Here's to a great experience. "I'm not from the South, but I got here as fast as I could". As I have mentioned before, my sweet Southern friend gave me that little sign. I am a Midwesterner, but after living in the South for 20+ years, I should qualify as a naturalized Southerner by now, right? I found the book The Help very interesting and frankly not far from the South I experience here today. I have no interest in a controversial blog, but our paper had an article on The Help and its food, and I knew I had go there! When you think of Southern Food, it is no secret that much of the socially elite Southerners didn't cook their own "Southern Cuisine". Much of the food we associate with the South was the food made by The Help. The movie touches on this as well. I love the fantastic cuisine of the South, and was happy to see a few recipes printed in the paper that the food stylist and her helpers used for the movie. The article can be found here, and the Black Eyed Pea Salad looks delicious, but I would have to eat the entire thing on my own. The fried chicken recipe is a Southern staple, I have been soaking my chicken in buttermilk and Crystal's Hot Sauce for as many years as I have lived south of Michigan. So I opted to make Minny's Chocolate Pie. 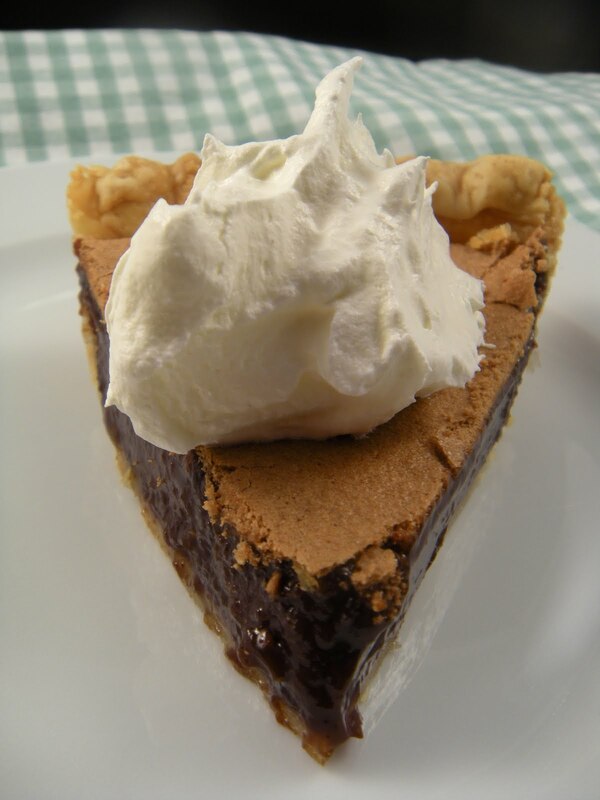 If you haven't read the book or seen the movie, let's just say that Minny's Chocolate Pie plays a starring role. In the article, the stylist says they made more than 50! I had never really thought about chocolate pie until I moved to Memphis. It is on the menu at all the BBQ joints, and is also called fudge pie, but my own pies tend to filled with fruit. I thought back to my childhood, and I can remember my mom took me to Bishop's when my dad was out of town. It was essentially a cafeteria, slide the tray and choose your food, and there at the end, every time waiting for me was Chocolate Ambrosia Pie. It was a chocolate pie, but it certainly wasn't anything we ever ate outside of Bishop's. I was enamored with the chocolate curls on top of the whipped creme. I mean this is 1979 we are talking about! And after a quick search, I find they are still in business, not in the location I went to those few times, but just a town away. And that pie? You can buy the whole thing for $8.49. That's a far cry from the Southern chocolate pie for sale just down the street for $17. I even found a few recipes for Bishop's pie, but they all use instant pudding mix. I guess my palate wasn't fully developed in 1979. I am making Minny's for hardly anything. Chances are if you are a baker, the ingredients are in your pantry! And it is way better than a pudding pie. Fit crust into 9" pie pan. Crimp edges and prick bottom and sides (I forgot to do that). Preheat oven to 350° (I used convection at 335°). Mix sugar, cocoa and butter in a mixing bowl. Add eggs and beat with a mixer 3 minutes. Add salt, milk and vanilla. Pour filling into shell and bake for 35-45 minutes or until edges are brown and filling is slightly set in the middle. Cool completely before serving. Can be refrigerated or served at room temp. You'll also see the pie as a double crust pie in the movie in a scene. But most often Minny makes a single crust with a big dollop of whipped cream! The recipe calls for a refrigerated pie crust, and yes, I went there. I love home made pie crust, no doubt. But trust me, this pie is so rich, so decadent, the crust plays a pretty small role. Of course for unsweetened cocoa I used Pernigotti. The evaporated milk makes the filling smooth as silk, the pie is just delicious. I must admit though, that my pie looks a lot juicier the the pie in the movie. But trust me, you will enjoy it as much as Minny's admirers (and enemy) enjoyed hers! So, what are ya waiting for? Get in there and bake! There are lots of times I am baking up a storm with a purpose. Perhaps a few dozen for a friend or family member. But when you have extra dough, what is a baker to do? It's a lovely dilemma. This is when I go pawing through my bins of cookie cutters and start thinking of what I would like to attempt to decorate. Cookie cutters I have never used. I have some great antique ones, but I was not happy with the results, some children's characters', those will require some time to decorate. But there in my freezer were some miscellaneous hearts and stars, some anchors and squares, just some basics to remind me that I never got around to doing all the 4th of July cookies. Enough to satisfy a few, but not as many as I ambitiously planned when I was rolling dough. It works like that sometime. But it is nice when you are doing an order and have all this great frosting and there in the freezer is a bevy of cookies ready to go. I did these to take to my childhood friends and a few relatives on my Midwestern road trip. They were a hit! Never mind they were intended for the Fourth, a birthday party or a thank you. They're just cookies...and no one ever complains! Back to the road trip soon. And I suppose at some point I will have to cook too. Thanks for hanging around. I will, get in there and cook!! So we continue our journey on the Great Road Trip, the second destination in the 1700 mile journey, DeKalb, IL. Perhaps best known for its namesake corn, you see the signs all over the Midwest, birthplace of barbed wire and it is also home to Northern Illinois University. Most important, the home of my mom Joan. She grew up here with her 4 sisters and brother, my grandparents Helen and Ed, and her Grandfather. I visited with Christina, my sister Lori, my cousins Chantal (her 2 children) and Susie, their mom my Aunt Jeannie (my mom's sister) and of course my parents. So in good form, our first stop was the Serbian Cemetery. This is where my Great Grandfather Steven Miskin is buried. He was quite a figure in the Serbian community and I have been to his childhood home in Trbinje, Bosnia. This cemetery is very different from Mt. Carmel in Chicago, here the Serbs have a small corner of a large cemetery. The names can be quite hard to pronounce, but like my Italian side, they came here willing to do whatever it took to be Americans. They worked very hard, they sent much of their money back to the homeland to help the other family members, and they embraced America. The Serbs in DeKalb still tend to this little cemetery, paying tribute to those brave immigrants. We drove by the old houses, and took pictures trying to remember what it all looked like 40 years ago. My Grandfather was a tavern keeper, and Ed's Tavern was a short walk across the backyard from the house I remember so well. It was a small tavern with a loyal customer base. It was nestled in a neighborhood so many patrons walked there. During WWII, Ed framed a photo of every neighborhood serviceman and hung them on the walls. 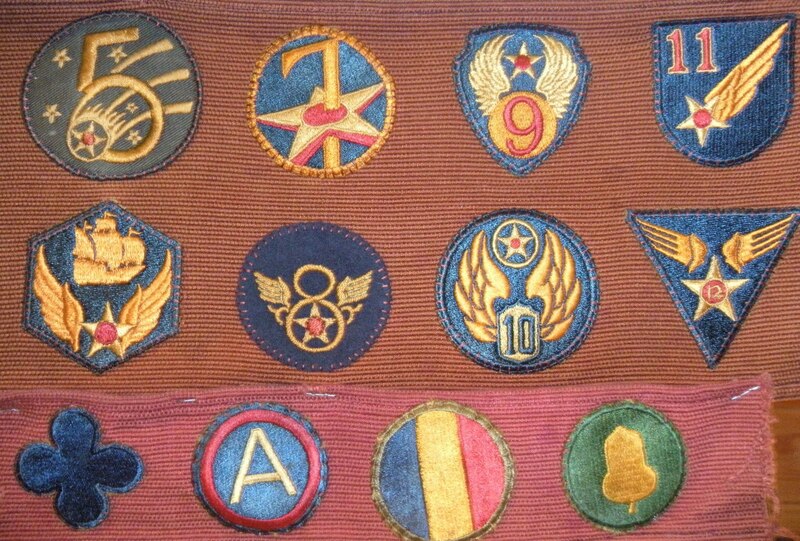 The young men would return and give Ed a patch from their battalion, squadron or unit. He made a large banner that hung as long as the tavern was there. My mom now has this banner, and it still smells faintly of cigar smoke and beer, or perhaps it is the wonderful memories that we smell. The banner is one of the most complete of WWII patches. We have encouraged her to find a home for it where it can be preserved and admired, but she is afraid it would end up in a drawer in the archives of museum. As a kid, I would go into Ed's through the back door. There was a large rounded fridge and he always had Chocolate Kayo Pop in a bottle. If I helped him wash glasses in the warm water with the fuzzy heads, I could earn a pop and maybe a pickled sausage. I never ventured to try a pickled egg. I thought being in that bar was the most wonderful thing. There was a Hamm's Beer sign, (sing along, Hamm's the land of sky blue water...) and the sign changed or moved. I can't remember. I always thought that Hamm's was from Wisconsin, and as a kid, that was my second favorite place, Delavan, Wisconsin, but alas, it is from Minnesota. Oh well. A few years back, the new owner of the house and tavern let us have a look around and took us into the tavern. It just didn't stir any memories. It is great to think back to that era. Men don't stop in and have a beer with the guys on the way home anymore. And they can't really take the wife out for a drink in the neighborhood. But wouldn't that be fun? I will do a blog on Ed's and the photos I have. We then went to the Catholic cemetery where Ed and Helen rest. My mom has lost 2 of her sisters, and both have had ashes scattered here. Losing my grandparents is one of those memories that makes my heart ache. I was in 2nd grade when Ed passed. It was really hard for me to understand. I was in high school when my Grandma passed, and to this day the smell of roses brings back her funeral. It is all I can remember. I still look for Jergen's Lotion in the original formula, my Grandma used it every day, and smells just like I remember her. As we left the cemetery, I passed the grave of John Manekitis (I know I spelled this wrong). He and his wife are buried together and I never knew them, but I know the name so well. My Grandma had a cat maned John Manekitis. We always thought this was a funny name when we were kids, but he was apparently someone they all remembered and John (the cat) was a great pet. Walking past his grave made us all giggle as we thought about our funny and loving family. Maybe someone will name their pet SweetiePetitti one day. You never know! We had dinner in DeKalb with my mom's best friend from grade school. 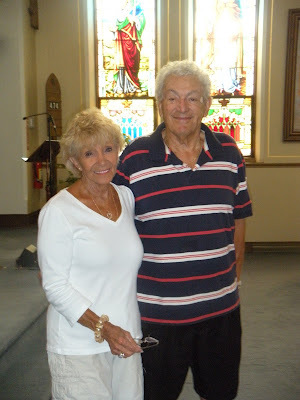 They have their 65th class reunion later this summer. That is amazing. This photo is from a few summers ago, but my mom and Pauline have maintained their friendship for over 70 years, and much of that before the advent of the internet. They haven't lived in the same town for almost 60 years. Isn't it amazing waht Christmas cards and phone calls do to maintain a friendship? The next day we took a long walk around the campus, gorgeous! And then before we hit the road for the next chapter, we went to the church. St. Mary's Catholic Church. The church opened in 1901, and was truly a neighborhood church. My mom and her siblings all attended the school there, and my mom would go to church every morning before school and on weekends to play the organ for Mass. My mom and dad were married in this church 59 years ago. Sadly, there was a fire in the mid 70's which took much of the grandness of church with it. Today, it is a little bare, and needs a little care, but the stained glass windows remain some of the most beautiful I have ever seen. We all said a little prayer and hit the road. The next stop is Clinton, Iowa. So I blog about a lot of stuff. I get a little feed back from Blogger that tells me what people are hitting with their searches. Apparently Faeto, Italy has brought me a few searchers, and here they found the food I love. And Faeto, Italy again, where they would learn about my trips there and the charm of Faeto and Celle. I am very proud of my Italian hometown. My Grandfather and Great Grandfather as well as my Grandmother all came from this charming mountain village. Another Faeto, Italy post is here with some of those details and a tribute to my dad and his ancestry. Periodically I get a comment from someone who has ancestors from Faeto. The names are familiar from the streets, the cemetery and sometimes the same as mine. Petitti. So one day not so long ago, I got a comment from a Bob Petitte. He thought his family name had changed from Petitti. He told me about his grandfather coming over, and his dad going to his cousin Patsy's farm in Dundee. Hmm. I was curious. My dad and Grandfather are both Patsy, also known as Pasquale. And, they lived on a farm in Dundee. He left his email so I contacted him and gave him some info and asked him what else he knew. He sent a picture that made me, my dad and my Uncle Mike all drop our mouths. It was of his grandfather and his great uncles. 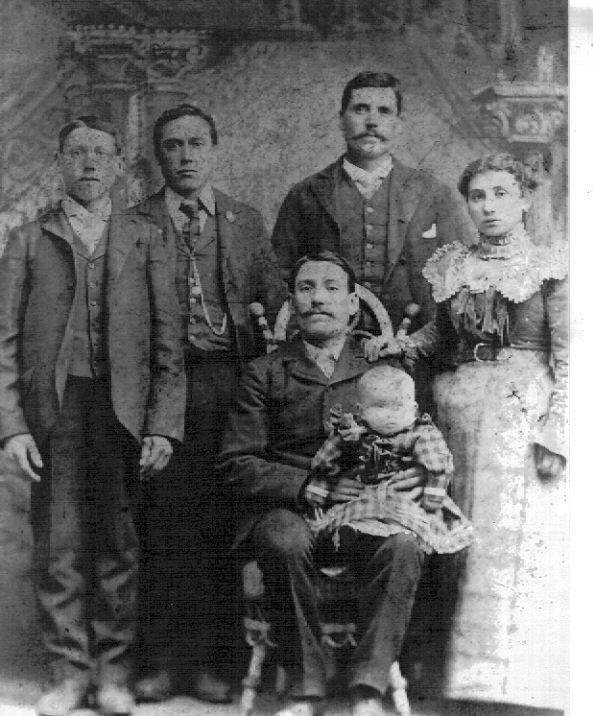 And there in that photo is my Great Grandfather. The exact photo found on his tombstone in Mt. Carmel. We were related. When we began planning the summer adventure, I emailed Bob and he agreed to have dinner with our entourage. So we found a pizza place, casual, loud and perfect for our large 20+ group. Bob is just a little older than I, but his grandfather was the last of something like 11 children, so his family tree is essentially a generation behind mine. It also means that most of Bob's family tree has passed. How wonderful that we could introduce him to all these new relatives. I have started a new blog called Faeto in hopes that people will google and get there. I would love to have a meeting place and find family, friends, distant relatives. We hope one day to have a Faeto reunion. Now that would be quite a story! We then ventured to Greek Town. Now I have no Greek blood, but I LOVE Greek food. It is very similar to the Serbian food my Grandma (on my mom's side, we will get to that cemetery in a few days...) made. I have yet to find an amazing place in Memphis for Greek food. 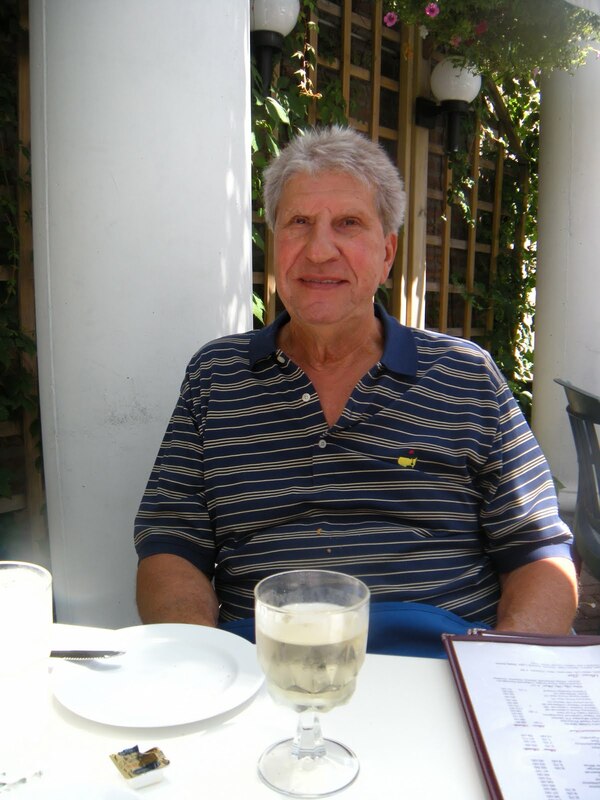 So Uncle Mike and I had lunch outside with the fountain trickling and a gorgeous breeze off Lake Michigan. We had Saganaki to start, and I had an appetizer assortment platter with fresh pita. It was sensational, hummus, spicy feta, fish, olives, eggplant. Washed it down with a little Greek wine. And off we went! The next stop was my Grandpa's meat market on the corner of Paulina and Taylor. What a fantastic location, so great in fact, that there is a large medical center there. Not that I expected an old building with a slip of a paper receipt hiding in the walls (I do have a great imagination), but that would have been fun. We drove down Taylor Street which is commonly called Little Italy. Much of the land was taken over by the University of Chicago, and that community has been slowly displaced over the years. We stopped at Rosebud, a famous Italian restaurant and had dessert. Spumoni Gelato and a Cannoli with 2 Cappuccinos. Again we sat outside and enjoyed the mild weather. And then we went inside for a peek at the bar. It looks like the kind of place the Rat Pack would hang out in. 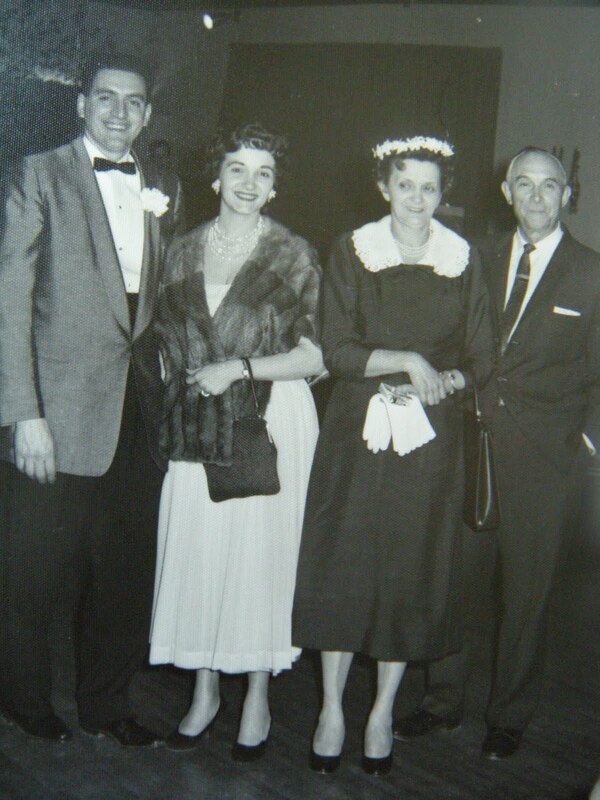 If I had been born 45 years earlier, I would have been a total Dean Martin groupie. So the last stop of the day was the North Avenue Food Mart which was my Grandpa's. It was there long after the meat market closed, so I was hopeful. 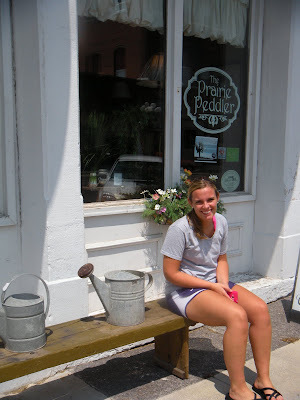 We drove through such quaint areas on our way, and then down North Avenue. It was bustling with people and businesses and it seemed to get a little more run down as we neared our destination at 2654. The building was shrouded in construction scaffolding, nothing of the building was really visible. Another defeat. But as I craned my neck to see anything, it dawned on me that so many members of my family walked on this sidewalk, and that was enough for me to take home. The day was amazing. I saw so much of Chicago and felt connected to my dad's past. I would love next time to spend a little more time, see more of the neighborhoods and taste more of the great food these areas have to offer. We finished up the day at Mike's daughter and son-in-laws house with their daughter. Hmm, first cousin twice and three times removed? Seriously. Cousins, period. I love my family, I consider myself very lucky! Next up, the amazing family reunion!